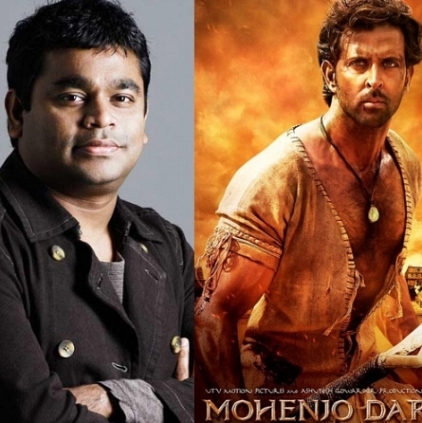 Hrithik Roshan’s adventurous drama Mohenjo Daro, which is getting ready to hit the screens on August 12th, has music composed by A.R.Rahman. Music lovers have been waiting for the album to release, as A.R.Rahman - Ashutosh Gowariker combination has worked big time in their previous outings such as Swades, Lagaan, Jodhaa Akbar. Looks like the fans will finally get to listen to the songs of Mohenjo Daro this week. One of the producers of the film, UTV Motion Pictures has tweeted “Get ready to be mesmerised by the maestro @arrahman's score. The #MohenjoDaroAlbum comes out this week! @iHrithik @hegdepooja @agppl_tweets”, thereby announcing that the music album of Mohenjo Daro will be releasing this week. Javed Akhtar has penned the lyrics for the songs composed by A.R.Rahman which has prominent singers like Shreya Ghoshal, Arijit Singh and Javed Ali crooning their voices for the songs. Is Nivetha, part of Vijay 60? Can Sundar C do what Mani Ratnam tried? A R Rahman Celebrates His Wedding Day Today! What Is A R Rahman Doing In The US? People looking for online information on A R Rahman, Hrithik Roshan, Mohenjo Daro will find this news story useful.